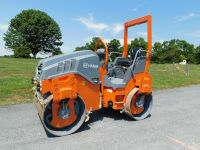 JFW Equipment carrles a wide range of asphalt rollers. We purchase and repair rollers of all sizes and weights. Our inventory of rollers is constantly being updated so be sure to bookmark our page to see our latest offerings. JFW Equipment is a trusted source for rebuilt Asphalt Rollers and has been for over 40 years. We ship worldwide. Contact us. We can help you find the right roller at the right price. We carry rebuilt and refurbished rollers from Ingersoll-Rand, Bomag, Hypac, Leeboy, and other fine makers. Our expertise with used Asphalt Rollers and diesel engines insures that you get the best possible asphalt roller at the best possible price. We frequently feature a wide range of vibratory rollers , from large double-drum vibratory rollers to single drum compactors. You can rely on JFW Equipment to choose the best used asphalt paving equipment available and then inspect, repair and revitialize each piece of equipment we sell. We also have a wide variety of rebuilt and refurbished drum rollers from all the major manufacturers. We have years of experience in rebuilding paving equipment of all types. Our long-standing commitment to Asphalt Paving Equipment is built on constant communication with the paving industry.